The huge amount of rain, followed by warm temperatures have made my flowers lush and green. 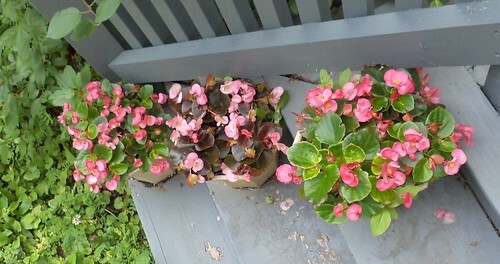 The begonias on the front steps are filling the pots very nicely. They seem quite happy on the front steps and it makes the front look nice, considering the flower beds on either side of the front door are really overgrown. (sigh) One of those things I need to do. And it has to stop raining so I can repaint the top of the front steps. You can't see very well. I was on my way to work when I took this. There are 4 banana peppers on that plant. Plus, there are 4 more blossoms. It's fallen over and I need to find my stakes to stake it upright. 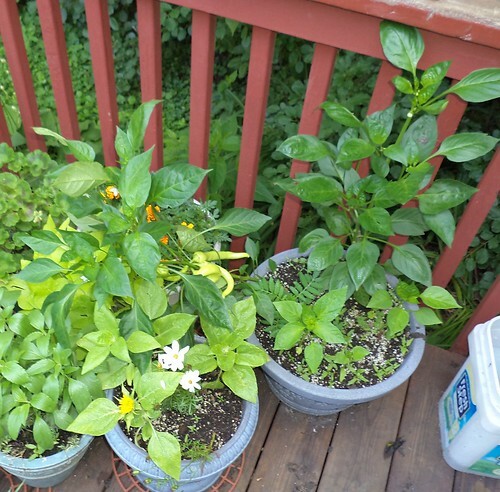 Perhaps, by the 4th, at least one of the peppers will be ripe enough to eat. They get a lovely banana yellow when they are ripe. I need to weed all of the pots and remove the weeds. It's interesting how weeds spring up, even in flower pots. I'll be doing some rearranging of the pots this weekend, but everything is lush and flowering. This space is really nice. Now, it just needs to quit raining so I can enjoy it, although the mosquitoes will be in abundance. Where did I put those citronella candles? 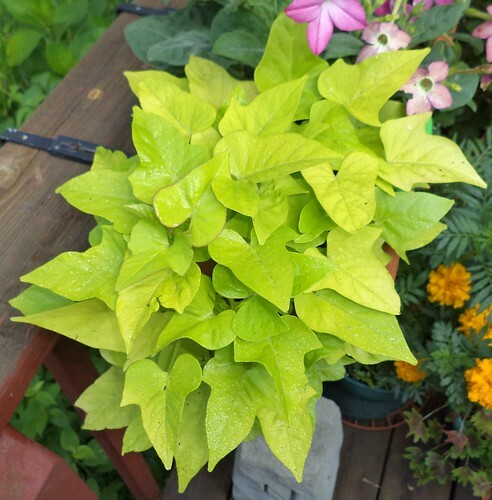 Finally, as promised, here is a close up of the potato vines. If you look closely, you can see what looks like a red outline around some of the leaves. I think that adds a distinctiveness to the plant. They seem to be loving the deck pots and are cascading over the sides beautifully. Some years, my flower choices are 'meh'. This year, I'm really happy. It also could be my attitude, but I come home and this space brings me cheer and peace. I do need to cut back a couple of branches as they whap you in the face if you're sitting next to the birdbath. Otherwise, this is a happy place.